Provide comfort for the family of Yolanda Dippolito with a meaningful gesture of sympathy. Yolanda Dippolito, 91, a resident of Hopewell Junction for 5 years and previously of the Bronx, died on April 2, 2019 at Vassar Brothers Medical Center. Born on October 8, 1927 in the Bronx, Yolanda was the daughter of Edward and Nancy (Calabria) Cherubini. On April 30, 1950 in the Bronx, Yolanda married Michael Dippolito who predeceased her on April 6, 1998. 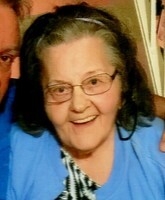 Yolanda loved her puzzle books, watching games shows and spending time with her family. Survivors include her children, Lucy Ciraolo and her husband Jack of Hopewell Junction, Michael DIppolito and his wife Michelle of Rye, Edward Dippolito of Standish, ME and Patricia Barbera and her husband Bobby of Poughkeepsie; her grandchildren, Michael Jr. and his wife Samantha, Edward Jr., Lizette, Sabrina, Katalina, Cody, Anthony, Zachary, Michael, Stephanie, Bobby Jr. and Brianna; and his great grandchildren, Giovanni, Bella, Jaxson and Jayden. In addition to her husband, Yolanda was predeceased by her grandson, Jake Ciraolo. Calling hours will be held on Friday from 10am-12pm at the McHoul Funeral Home, Inc. 895 Route 82 Hopewell Junction. There will be a funeral service at 12pm followed by entombment at Rose Hills Memorial Park. Memorial donations may be made to American Diabetes Association or Alzheimer’s Association. Consider providing a gift of comfort for the family of Yolanda Dippolito by sending flowers.